While we're used to seeing colored Buddhist figures in traditional Tibetan thangka paintings, artist Dhondub Tsheten is trying to push the art's boundaries by including a major event from modern Chinese history. The Qinghai Province-based artist's series of more than 20 thangkas vividly depict the leaders of the Red Army during the Long March, such as Mao Zedong and Zhou Enlai, meeting with local religious figures from what are now Tibetan autonomous prefectures in Southwest China's Sichuan Province. Involving two years of effort by Dhondub and his team, the paintings were exhibited at Beijing's Cultural Palace of Nationalities in early November. "Yes, we're the first to depict the Long March through thangkas," Dhondub, the paintings' head designer, told the Global Times over the phone on Tuesday. "Though this is not the first time that CPC leaders have appeared in such paintings." Included by UNESCO in its Representative List of the Intangible Cultural Heritage of Humanity in 2009, Tibetan thangka is an ancient art form involving scroll paintings on silk or cotton depicting Tibetan Buddhist imagery, local folk legends and local architecture. The paintings are known for their brightly colored images painted with pigment made from local herbal extracts and decorated with precious materials such as gold and rubies. The Long March was a grueling military operation that saw the Red Army travel thousands of kilometers over rough terrain from 1934 to 1936. Prior to its Beijing debut, the Long March thangkas also toured to cities including Ruijin in East China's Jiangxi Province and Chengdu in Southwest China's Sichuan Province with the support of the Beijing-based China Research Center of Thangka Culture. The tour sparked a wide range of responses, "though so far, most responses have been negative, which is something I didn't really expect," Dhondub said. "I even received anonymous threats recently," said Dhondub. "My family is very concerned about my safety that they won't let me go out alone." According to local sources in Qinghai who wish to stay anonymous, since thangkas are an art form closely tied to Tibetan Buddhist practices, many see the depiction of secular figures in these "sacred drawings" as sacrilege. Dhondub, however, pointed out that thangka art involves more than its ties to religion. "Thangka in part embodies religious culture," he said. "But it also tells folk stories and legends, like those about King Gesar [a heroic figure in local folklore], and historical event such as Princess Wencheng's marriage to Tibet's ruler Songtsan Gampo. "So you can see, the stories that thangkas depict have a very wide range," he added. Articles and reviews on local social media platforms have begun politicizing the artists' creations, calling the Long March thangkas "red thangkas" or "products of the brainwashed." "I believe part of the reason behind these people's misunderstandings is that their memories about the Communist Party of China's history still linger on bad periods such as the Cultural Revolution (1966-76)," Dhondub explained. To his relief, the exhibition was well-received in Ruijin, the city from which the Long March started, when it arrived there in August. "People there were curious about thangka art as that was the first time many of them had ever seen this type of painting," Dhondub said. "They were excited because they were familiar with stories [about the Long March] but they'd never expected to see them interpreted using a Tibetan art form." 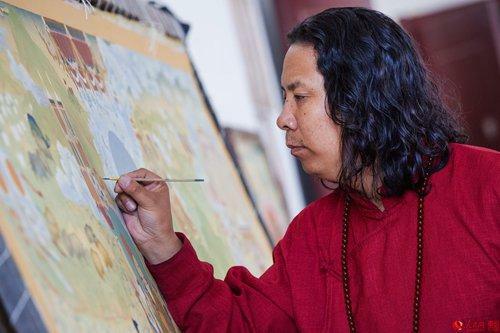 As the deputy president of the Qinghai Artist Association, the 40-something painter has spent the past 28 years promoting traditional Tibetan art including thangka and Laze, which Dhondub says is "a traditional shrine for the worship of nature spirits." 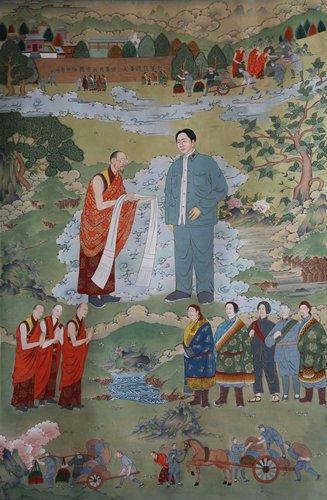 His best-known works include a 108-meter-long thangka depicting Princess Wencheng being escorted to Tibet and a Laze covering an area of 6,000 square meters that was recognized by the Guinness World Records in April as the world's largest Laze. Dhondub explained that the series of paintings were based on the book These Are The Places Where The Red Army Has Been. This award-winning work, based on interviews with members of the Red Army, was written by Gyanpian Gyamco, a Tibetan writer and former translator for the 14th Dalai Lama and the 10th Panchen Lama during the 1950s-1960s. Also a member of the China Research Center of Thangka Art, the 78-year-old writer approached Dhondub two years ago after looking at many other thangka artists' attempts to interpret the book. "Gyanpian Gyamco was not satisfied with their drafts, and so he came to me since we had cooperated previously," said Dhondub, explaining that he has done illustrations for several of the writer's books. Due to the complexity involved in painting a thangka and the unusual theme for the series, the 20 paintings ended up taking Dhondub and his team a total of two years to finish. "First we've painted more than 80 drafts," he added. "Then we picked 40 of them that we wanted to refine. Finally we produced the 20 that are on exhibition." When asked about his views about the negative response toward the series, Dhondub said, "I am just trying to depict from the perspective of a Tibetan the historical events involving the Red Army's time in Tibetan ethnic regions [in Sichuan] and how Tibetans assisted them during the Long March."